As part of our Clean and Green Campaign, our Recycling Team have been out and about recently visiting local schoolchildren to help them learn about recycling and protecting the environment for the future. 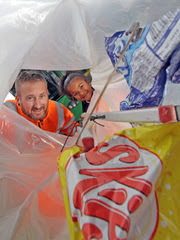 The children, from reception class, were visited by five of the Council’s Waste and Recycling Team. One of the Council’s Refuse men had a welcome return to Sunnyside Spencer Academy, 40 years after he was a pupil there! As well as learning about how the refuse vehicles work, the children took part in a litter pick to help them take pride in the local area.